I included a glossary and notes section in my Storyline player, but these tabs do not appear when I upload the output to my web sandbox. If I run the module directly from that web folder (or any other Windows Explorer folder) by clicking on the story.html, these appear correctly. I've updated all of the output files and folders and cleared my IE cache, but it still doesn't work. Any ideas? TIA. Are you able to test this in any other browsers to see if it's something IE specific? If you'd like to share a link to the published output here I'm happy to test, and additionally if you'd like to share your .story file we can test publish that as well. If you'd prefer to share it privately you can always send it to us here. I have the same problem with my projects. Did you guys get this resolve? This thread is a bit older - so I can't say what the resolution was in Kate's case - but you both were also likely using different versions/updates of Storyline and perhaps even with IE. Do you have an example to share here? We'd be happy to take a look. Thanks Calvin for sharing your file. I published it and uploaded to Tempshare here - and was able to successfully open it in IE11 and Chrome. The tabs appear, although the glossary is empty - but it's also empty within the player. Can you check that version I uploaded and let me know how it behaves for you. Can you tell me what version you use to test this? Here is the screen shot. I cannot speak for Ashley, but since she is out for the rest of the afternoon I thought I'd take a look. Looks the same as yours, but I'm not seeing the scroll bars that you pointed out. I don't know why when I click on the Tempshare link that Ashley provided above. It brings me to the html5.html instead the regular html file. 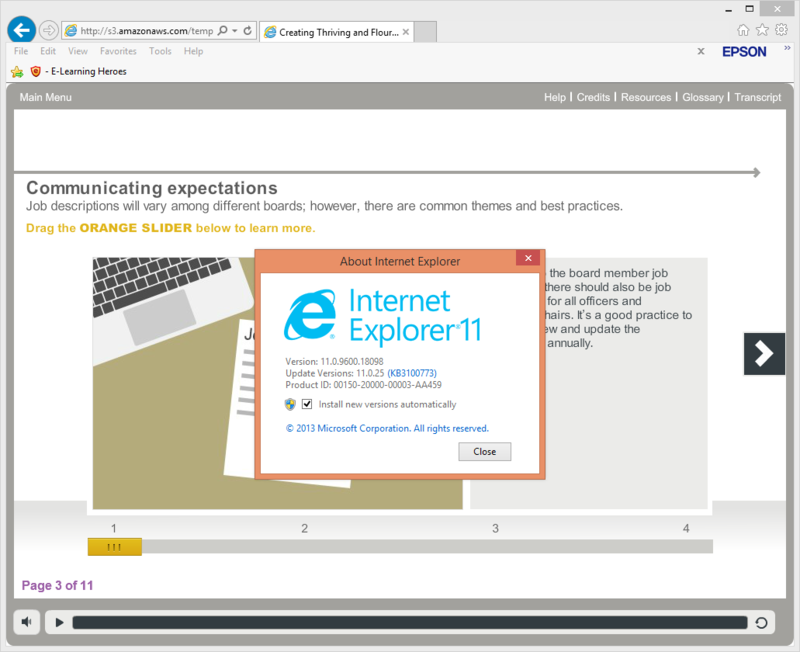 I didn't link to the HTML5 output - but if you're viewing HTML5 content in IE11 that may be a part of the issue. It would show you the HTML5 immediately if you had disabled Flash within your browser - but as IE11 is not a supported browser for HTML5 content, that could contribute to the odd scroll bar behavior you're seeing. Can you take a look at enabling Flash or viewing the content in an HTML5 supported browser such as documented here? Thanks Ashley, That's good to know.